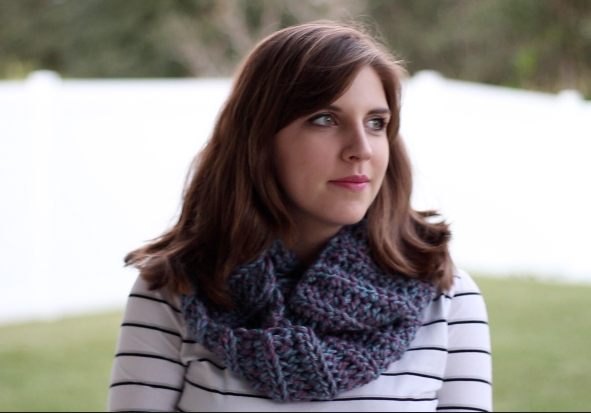 Today I have for you an easy scarf pattern & tutorial to combat this chilly weather. Okay. Here in south Florida its 61 degrees. But we are suffering folks. Not really. I’m sorry to all of you dealing with snow and ice. Anyway, here, have a scarf! This scarf uses two skiens of worsted weight yarn, crocheted together at the same time to make this scarf super warm and squishy! You could probably use one strand of a much chunkier yarn but I like the marble-y look that this has with both worsted strands. But do whatever blows your skirt up. The video tutorial below will teach you the 3rd loop half double crochet stitch that I use here – so if this one is new to you, please watch and enjoy! I love this stitch for scarves because it comes out looking more knitted than crocheted. And I can’t knit. Maybe one day but for now I will 3rd loop all the live long day. See my video above for help with the 3rd loop Hdc stitch! I hope you guys love this scarf as much as I do and keep warm! Thank you so much for sharing this easy lovely pattern. A friend and I do lots of crochet and I also love to sew specially love doing pretty skirts and dresses for children. My friend and I do a lot of crochet for a few charities here in the UK. We have been so busy making lots of warm articles so those in need can be a little warmer this winter. I am so glad I came across the above pattern as quick is what I love because one can do a little more with the extra time. May you and your family be blessed over the Christmas festive season and a very Happy New Year as well. I just made one with the same colors you have used to give to a friend and I loooove it. I will make several for my daughters and other family for Christmas present! May I ask what other color combination you would suggest? I love doing this scarf in neutrals too! Light grey and beige, or cream and tan! What chunky solid color yarn would you recommend for this project? I would use Lion Brand Wool-Ease Thick & Quick in any color! Love this! Your tutorial was easy to follow as I am just a beginner. Making one for a Christmas gift. I lost count of how many rows I’ve done. oops! Hope I can figure it out.